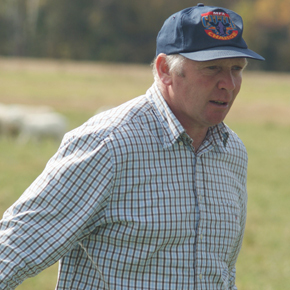 No living sheepdog handler has proven himself in competition more than Aled Owen. This young man from North Wales has won the International Supreme three times and the triennial World Trial two times with dogs of his own breeding lines. Aled Owen of Wales. Photo by John. And now, Mr. Owen brings all his teaching wisdom and experience, tested around the world and at his own training center, to Heatherhope Farm for a three day clinic, August 31 and September 1 and 2. We will limit this clinic to a maximum of 12 dogs, and give preference to those who sign up for all three days until August 1. Until then those who wish to sign up for single days will be placed on a wait list while we attempt to fill the clinic with those who can work all three days. Handlers will work their dogs twice each day. There is a chance that on Thursday the practice sessions will be a bit briefer since we will have to conclude the clinic by mid-afternoon in order to travel to Portage, Wisconsin, where Mr. Owen will be judging the Wisconsin Working Stock Dog Association Trial, September 3-6. The cost of the three-day clinic is $255 for a first dog and $225 for a second. If and when we open to single days the cost will be $90 for the first dog and $80 for the second. To audit the clinic will be $30 per day per person. For clinic participants who wish to add private lessons (if time allows and Mr. Owen is willing) the cost will be $65 per session. Working spots are guaranteed only upon full payment. Full refunds will be granted if requsted before August 1. After that date the refunds will be made only if someone else takes your place. Continental breakfasts and a lunches will be provided for those who pay for the clinic spots. Friends who come with will be asked to donate $5 per meal if they are not paying for the clinic or for auditing. Further information about times, nearby motels and camping, etc., will be shared with those who sign up for the clinic. Hello, I just wanted to see if this is for beginner dogs or does it have to have experienced? The clinic is for all levels of experience. As always it would be good for you to have a stop and a recall for your dog so that you can get the most out of a clinic. Do you want to ask any other questions? I am always willing to talk things over. Use the contact information on the web site to get in touch with me. I know you will like Aled Owen. He puts all his energy and experience into giving your money’s worth.